Mitt with Baseball Chocolate Mold. Approximate Size: 1.5 x 1.25 inches. 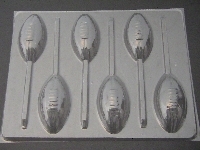 Football Chocolate Mold. Approximate Size: 3 x 1.75 inches. Mitt with Baseball Chocolate Mold. Approximate Size: 2 x 2.25 inches. Basketball Chocolate Mold. Approximate Size: 2 inches. Also Available in Hard Candy Molds. Football Player Chocolate Mold. Approximate Size: 2.75 x 2 inches. Also Available in Hard Candy Molds. Baseball Chocolate Mold. Approximate Size: 1.5 inches. Also Available in Hard Candy Molds. Golf Ball Chocolate Mold. Approximate Size: 1.75 inches. Baseball Player Chocolate Mold. Approximate Size: 3.25 x 1.5 inches. Also Available in Hard Candy Molds. Baseball Cap Chocolate Mold. Approximate Size: 3 x 2 inches. Also Available in Hard Candy Molds. Football Helmet Chocolate Mold. Approximate Size: 2 x 2 inches. Football Helmet 3D Chocolate Mold. Approximate Size: 2 x 2.25 inches. Bowling Pin and Ball Chocolate Mold. Approximate Size: 3.75 x 2.75 inches. Football Helmet Chocolate Mold. Approximate Size: 3 x 3.5 inches. Also Available in Hard Candy Molds. Baseball Player Chocolate Mold. Approximate Size: 2.75 x 1.5 inches. Also Available in Hard Candy Molds. Soccer Chocolate Mold. Approximate Size: 1.75 x 3 inches. Tennis Ball Chocolate Mold. Approximate Size: 2 inches. 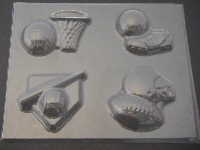 Sports Theme Chocolate Mold. Approximate Size: Assorted inches.